Standard for most parties, drinking and dancing! So of course we can help you in both departments. With a variety of bars and dance floor out there to go along with your theme. 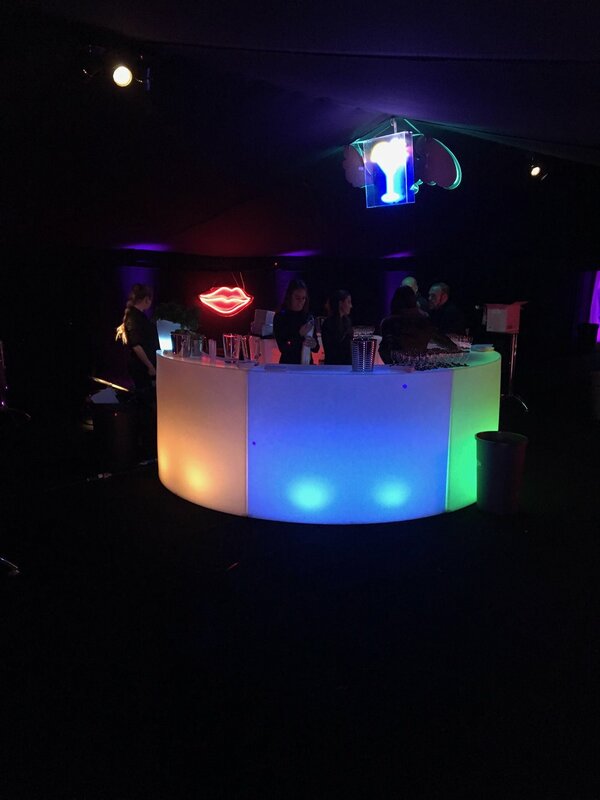 Our standard bar that we stock is a curved, white LED bar unit that is approx 1.5m in width and can be linked together with up to five in total to create a circle. The colour of the LEDs can be changed to lots of different colours via a remote control to match your colour scheme, or for that party feel you can have different colours changing by fading or flashing automatically. There is a shelf behind the bar which is ideal to store drinks or glasses. Black, white, silver or even wooden rustic bar units are also available that are around 1.2m in width and again can be linked together if required. There are also rear units with shelving that can be used behind the bar to store drinks and glasses. We currently offer three types of dance floor which are black & white chequered, all white and parquet. As a general rule of thumb we recommend that the size of dance floor you should have caters for 25% of your guests in sq/m, so for 100 guests we suggest 25sqm of dance floor. Of course this is space permitting which we are happy to advise on. It is also possible for us to hire in an all black dance floor, as well as white or black LED dance floors and neon dance floors.